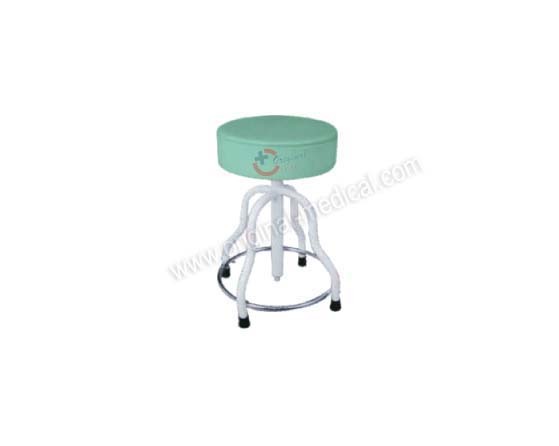 At Original Medical Equipment we are leading manufacturers, suppliers and exporters of best quality Hospital Patient Revolving Stool. This adjustable multi functioning stools are useful in hospitals, clinics and other medical services. This stool is designed according to long time purpose with adjustable functioning and comfortable for patients. It has also a cushion foam seat to sitting. Due to their lots of functioning this is most demanded hospital patient stool in market now days. If you are looking for these Hospital stainless steel patients revolving stool for your clinic, hospitals and medical collages its right place then. Frame work made of CRC steel tubes of 25 mm dia. Mounted on rubbed shoes. 35 cm . Upholstry top fitted with stroaccurate machine screw. Chromium plated ring fitted with the legs for foot rest. Height adjustable for 45 to 68 cm. Max and epoxy powder coated. Also contact us for Hospital Surgeon Chairs, operation room stools, bed side stools etc.